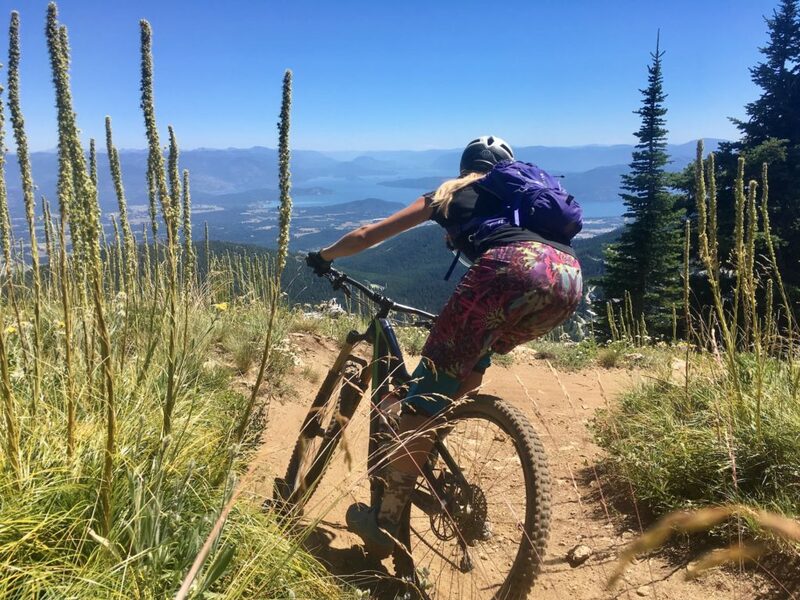 Foodie by day, mountain biker by night… actually just kidding, Ali is both all the time! She started biking around ten years ago, when she realized spinning on a bike indoors in the summer seemed like a ridiculous idea. This “aha!” moment led her to get involved in both road riding and racing. 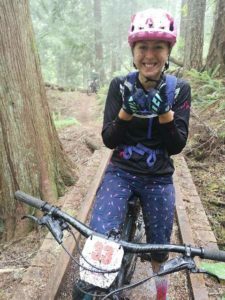 A big move to BC helped to affirm her passion for mountain biking, and she hasn’t looked back since. Her experience grew from her foundation: a rider who had the physical capacity but no technique. Jumping feet first into racing, “it was a disaster at first,” Ali laughed, but eventually she succeeded and has competed in many Endurance Cross-Country and Enduro races. When Ali started out, she didn’t know many women in the sport. It was mostly men who she looked to for advice and often got vague responses and tips: “Oh it’s easy, just hit it like this”. She realized pretty quick that she needed a different perspective or some coaching. Well the opportunity arose to shadow a good friend who was a former mountain bike coach and it blew her mind how a change in the explanation of techniques amounted to her learning so much better! After this experience, she started learning a lot faster, and then a few years later she was offered a spot to Coach. No one was coaching out in Kimberley and they were looking for coaches and mentors, which is where Ali got her coaching start. To be more specific, 2015 is when Ali started coaching for the local Kimberley mountain biking club. She joined up thinking it would be a great way to give back to her community, and she hasn’t looked back since. Her first year coaching was a blast, but she found herself sometimes struggling to explain the technique. This led her to become more established and took her PMBI Level 1 Coaching Certification. After this, she began coaching older kids and women. 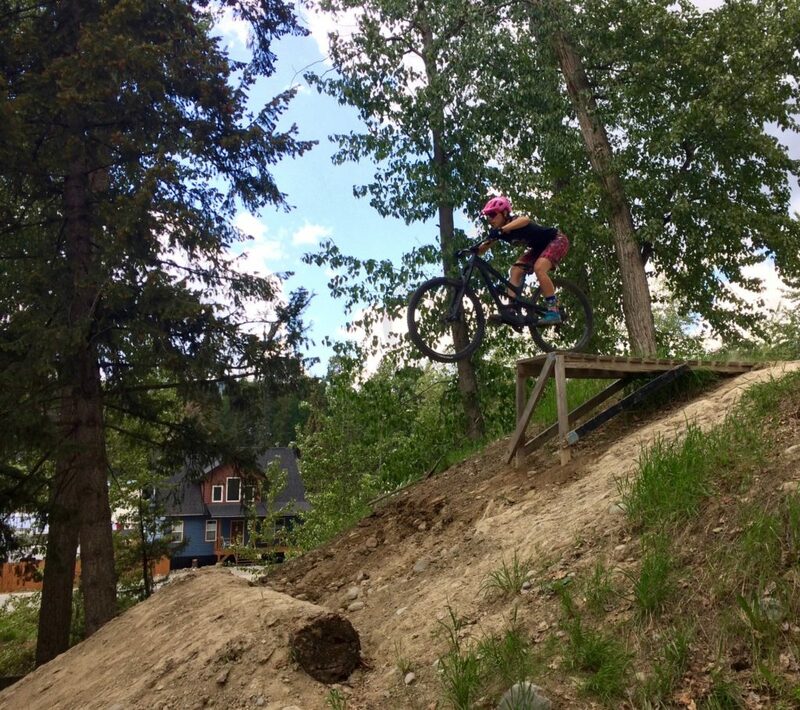 Ali LOVES mountain biking, and she wants her students to feel the same. You can meet so many people and travel through some pretty amazing places. As much as coaching is not necessarily a necessity, it allows you to go so much further in your riding in a faster, safer, and more fun way! Ali just wants her students to feel confident on a bike. Her style is far from militant, she doesn’t want to be the drill sergeant, she wants to be the inspiration—inspiring you to ride your bike in a fun and safe way. Beginners are one of her favorite skill levels to teach because establishing a good foundation and basic understanding of the skills and techniques can really impact your riding in wonderful ways, and it’s noticeable right away. For herself, Ali learned that using her brake (or alternatively not brake as much) and cornering were areas where her new-found technique showed improved riding right away. Wishing she would have started coaching sooner in her riding career, Ali always suggests to try it out if you’re looking to improve your riding. Listen to your gut, it’s okay to work within your boundaries, but be ready to push them too! It’s always important to remember and be aware of time of day, your fatigue, and your gut. Ali is so excited to be a part of our team and we are so excited to have her. The overwhelming response from Kimberley has us so excited to have such a wonderful coach on board riding new terrain for our courses. Be sure to check out Ali’s course offerings and register soon! « Jackie Kowalenko, Calgary Bike Instructor & Bike Mechanic.